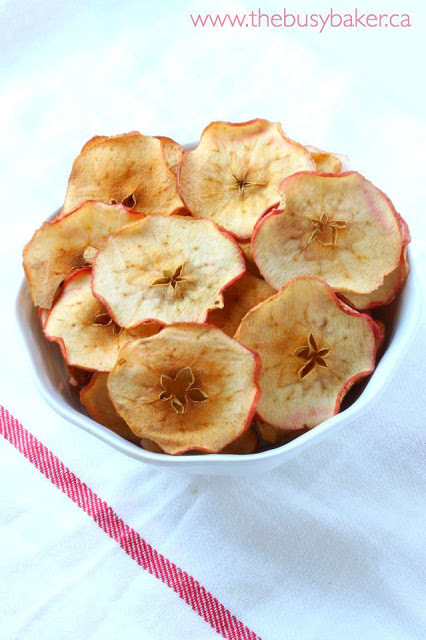 This apple chips recipe is easy to make, and homemade apple chips are the perfect healthy snack for a fall day. I know you’re going to enjoy them just as much as we do! In an effort to use up all my apples this fall, I decided to dust off an old recipe I haven’t made in years…like, about 10 years to be more precise. 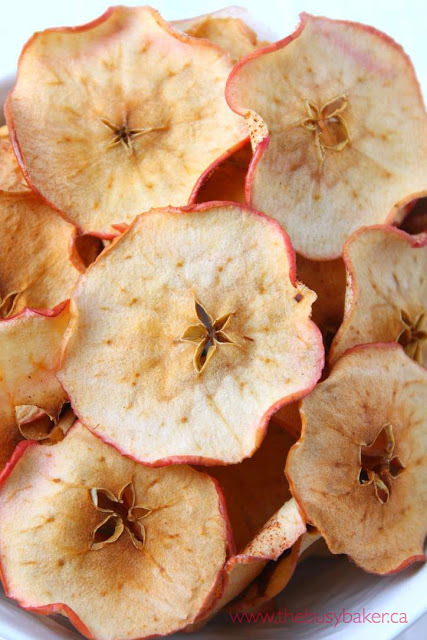 And I’ll be honest, once I was enjoying these apple chips with my kids this week I felt a little sad for all those years I wasted not making them! They’re so delicious! Want more easy apple recipes? Make a batch of Apple Crumble Muffins, or try this recipe for Healthy 2 Ingredient Slow Cooker Apple Butter. It’s also helpful to have a mandoline to slice the apples thinly. This one is pretty great. It does the job nicely and it’s compact enough that it won’t take up much drawer or storage space. Start by washing and drying your apples. Slice them using the mandoline, starting from the bottom of the apple and working your way toward the stem. This will create very thin slices that show the beautiful ‘star’ effect on the inside of the apple. If you don’t have a mandoline try to slice the apples as thinly as possible with a sharp knife. If the slices are too thick they won’t crisp up nicely. Brush off any seeds, arrange the slices of apple on a parchment-lined baking sheet and lightly dust the apples with a touch of cinnamon. The cinnamon is totally optional. 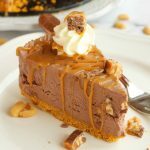 I’ve made these with and without the cinnamon and they’re fantastic both ways. It’s okay if the edges of the apple slices overlap slightly, but it’s a good idea to make sure they’re as spread out as possible on the baking sheet. 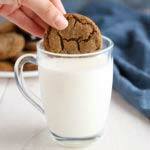 This will ensure that they crisp up within the baking time. Let them cool on the baking sheet for a few minutes before transferring them to a plate or cooling rack to cool completely before putting them in a bowl. This will ensure they stay crispy! 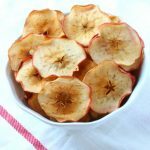 My kids absolutely love these baked apple chips and so do I. They’re the perfect healthy snack, they’re easy to take on-the-go, and they’re also fun to make with kids! 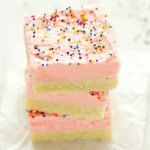 And they’re the perfect Weight Watchers PointsPlus treat, because they have ZERO points! Need more healthy snack ideas? Make up a Berry Banana Oat Smoothie, or these Healthy Toddler Friendly Mini Muffins. 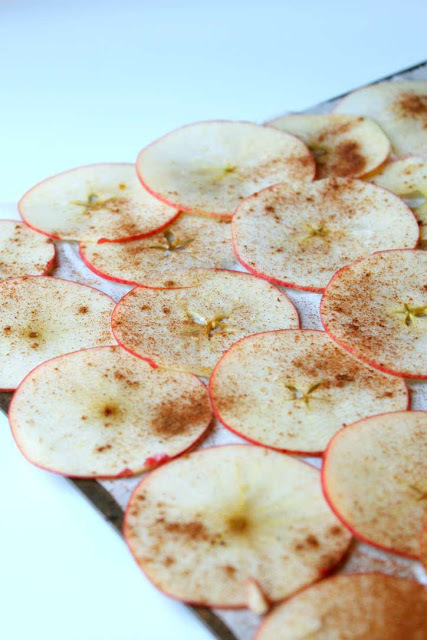 Thinly sliced apples are dusted with cinnamon and baked until golden and crispy. 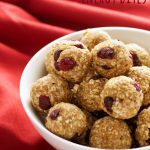 The perfect healthy snack or lunchbox treat. Start by washing and drying your apples. Slice them using the mandoline, starting from the bottom of the apple and working your way toward the stem. This will create very thin slices that show the beautiful 'star' effect on the inside of the apple. If you don't have a mandoline try to slice the apples as thinly as possible with a sharp knife. If the slices are too thick they won't crisp up nicely. Brush off any seeds, arrange the slices of apple on a parchment-lined baking sheet and lightly dust the apples with a touch of cinnamon. Space evenly on a baking sheet, trying not to overlap the edges of the apples. Place pan into oven and bake for 45 minutes; flip slices and bake for an additional 30 minutes, or until apples are dry and golden brown. Love this simple and healthy treat. These dried apples would be great added to granola as well. These look delicious! 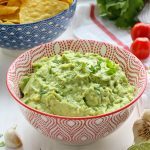 Can they be stored for later and what is the best way to store them and for how long? Thanks Sandra! They can be stored in an airtight container for several days, but ours never last that long! They’re too delicious!